Across Maryland, but especially in Baltimore, there are high expectations for the final report – expected soon – of the Kirwan Commission, the panel assembled by the legislature to overhaul public education. How to measure whether their two-year effort to improve learning – and rework the funding formula – does right by the city’s struggling schools? 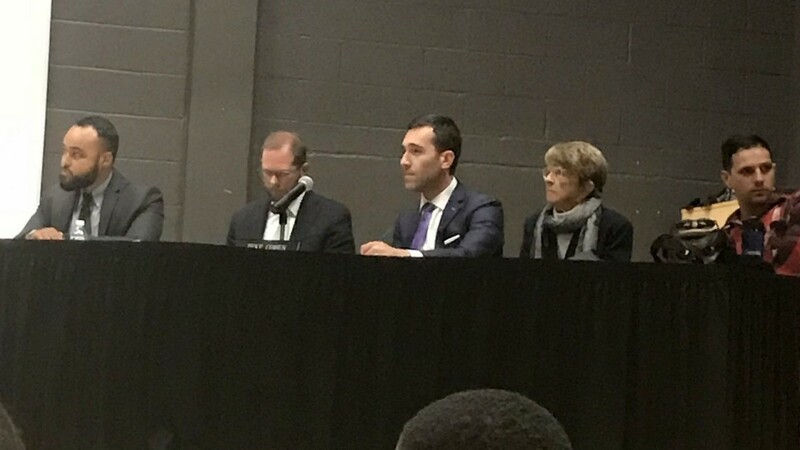 Preparing to answer that question with one voice, city leaders assembled school officials, parents and students last night at the new Dorothy L. Height Elementary School in Reservoir Hill. City Councilman Zeke Cohen, who organized the event, said that the commission would need to address concentrated poverty in Baltimore. And, he noted, you can’t talk about the poverty in Baltimore without addressing racism. “When folks throw stones and say mismanagement, we need to push back and be really clear that this is about inequity and not funding our schools and not supporting our kids in the way that they deserve,” he told a crowd of about 100 people. Along with Cohen, who chairs the Council’s Education and Youth Committee, other attending the meetings were vice chair Mary Pat Clarke and Councilmen Kristerfer Burnett and Ryan Dorsey. Most of the speakers had the same message: that any new funding formula must specifically factor in the history of racism and redlining that has contributed to the extra challenges faced by city schools. But they are not the only school advocates bracing for Kirwan. Equity platforms have also been prepared by the ACLU of Maryland and the teachers’ advocacy group BMORE (Baltimore Movement of Rank and File Educators). And in Annapolis yesterday, a race equity expert, Ivory Toldson, addressed the Kirwan Commission to present specific policies to address racial inequity. At last night’s meeting, City Schools CEO Sonja Santelises expanded on the inequality theme, noting the many school programs that could get a boost from the commission’s decisions. Early learning services, college and career readiness, and student mental and physical health services could all use a boost, she said, illustrating the point with a chilling anecdote. “There is one principal of a school that I spoke with, at a school that actually is improving school achievement, the principal said to me she had four third graders in the span of a week who had tried to jump out of windows to harm themselves,” Santelises said. Santelises told the crowd that, according to a recent state analysis, city schools are underfunded by $290 million a year. But that number, she said, should be higher still. Senator-elects Cory McCray and Mary Washington and Delegate Maggie McIntosh attended the event, as did Senator Bill Ferguson, all assuring the crowd they would be looking out for city interests in the upcoming legislative session. Ferguson warned that Baltimore no longer holds the same powerful influence it once did in Annapolis. “I’ve learned that you can have lots of really great ideas, you can have lots of great data, you can have lots of great facts, but if you don’t have the votes, you don’t get anything done,” the 46th District Democrat said, vowing to find common ground with representatives on the other side of the aisle. Parents and students also got a chance to voice their thoughts about ways that Baltimore City schools could be improved. Among them were Bard High School Early College students Ahnieyah Owens and Sade Jackson, participants in The Intersection, the Baltimore-based leadership development program for high school students. Parent Melissa Schober, who spoke last night said today that she was glad Ferguson addressed the challenges that the Baltimore delegation would face in Annapolis. Schober said she testified about the reality of “butts in seats” in Baltimore City schools – that is, the fact that the number of students are on the decline. The number of black and white students enrolled in Baltimore City Schools is down, with the uptick in Latinx and Hispanic enrollment the only reason the school system doesn’t have more significant declines. “My testimony focused on something that I haven’t heard talked about a lot which is the need for both the city council and the city delegation to Annapolis to exercise its oversight authority,” she said. That’s why lawmakers, she said, need to figure out a way to be accountable for those dollars so that they can be spent effectively.